According to a recent study released by the Pew Internet Research Project, Americans are more concerned than ever with internet privacy. 86% have taken some steps to avoid internet monitoring or cover their digital footprint in some way. Media headlines are filled with reports of government surveillance, data security breaches. Today’s consumers need to take deliberate steps to protect their online privacy and search history. What does your internet search history reveal? The places you visit online and the searches you use can reveal a significant amount of information about you. It provides an intimate look at everything from your retail habits to your political affiliations to your most personal interests. Search engines like Google retain detailed records about the terms you search, the links you click, and what IP address and device you conduct those searches from. Increasingly, many groups are anxious to obtain access to that information. Your information is recorded as you search and browse online. Governments are increasing their surveillance activities, marketers want as much information as possible about you in order to sell you their products, and employers are auditing online records to watch what you’re doing on the job. The data gathered is used in creating digital profiles which can be used to explore trends, to determine which ads a group is likely to respond to and much more. However, your personal digital profile reveals specific information about you. Even if you’re not doing anything that you feel is objectionable online, protecting your information ensures you won’t have to worry in the future. Whether you’re shopping online or just browsing news sites, protecting your privacy helps prevent hackers from accessing your information. One of the most important things you can do to protect your internet privacy is to use an updated and secure browser such as Chrome. Google Chrome browser is designed with special features that help protect your online privacy. Older and out of date browsers provide hackers with opportunities for unauthorized access to your data. Chrome’s best feature is the ability to use plugins. Plugins are small software programs that improve and customize the browser’s functionality. If you’re concerned with internet privacy, consider installing privacy supporting plugins such as SearchLock. For today’s Web searchers, SearchLock is the anonymous browsing tool that offers anonymous surfing that’s easy to set up. It works by detecting when you’re about to launch an unsafe web search and redirecting you to a safe search browser. 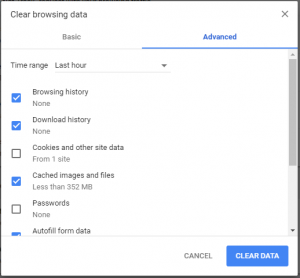 Another easy step you can take is to clear your browser’s search history, preventing anyone using your machine from looking at your information. To do this, open Chrome and access the history tab from the navigational menu. Open your history tab, click the button “Clear Browsing Data” and follow the steps to specify what you want to be deleted. Delete your history at least weekly to effectively protect your privacy. Keeping safety first in mind when you’re conducting online searches is a smart strategy in today’s environment. Take the steps needed to protect your privacy by using a secure browser, installing privacy protecting plugins, and manually deleting your history from your local computer. You won’t regret it! Liz Alton is an author who writes on a variety of topics, including digital marketing, technology, and small business. She regularly writes about the latest developments that help protect consumer privacy online and off.